Reed KumoSensor, a contact based door/window sensor used together with WeMo LED bulb and a KumoApp (Instructions on how to link your WeMo LEDs, Swtiches and Maker). It is amazing the variety of feature requests we receive since the release of Motion Sensor Tags in 2012. Some user wants to receive push notification every x minutes until door is closed, another user wants to receive notification when no motion is detected for y minute. With integration of WeMo switches and LED, Dropcam and Nest Thermostat, there will be even wider variety of possible features that are useful to some, but not to everyone to make it worthwhile to add more buttons/options to the already busy app screen. It is almost inevitable that we ended up with KumoApp. While our Web Service API is uni-directional (except you can define URL callbacks), KumoApp is natively event-driven with "actions" and "events". We host your KumoApps 24/7 on our Cloud server, so you can define event triggers and scheduled tasks, without having a computer always turned on that runs your programs to receive URL callbacks or run scheduled tasks. We store the log output of your App in our database so that you can download it anytime to analyze data. We automatically store some global variables (those begins with "$") of your app in our database and restore them the next time it runs, so complicated algorithms that span over multiple events can be defined. This allows implementing an integration in feedback algorithm, and apps with learning, adaptive and statistics/report generation that is not possible with "stateless" system such as IFTTT. 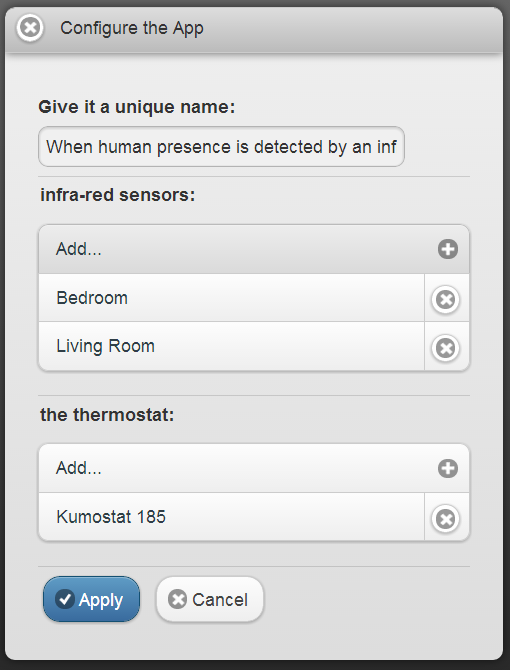 Native to Wireless Sensor Tags, KumoApp is faster and more flexible than IFTTT for those tasks that it supports. You can extend your IFTTT recipe to take advantages of the flexibility in KumoApp through the WirelessTag IFTTT channel's "New KumoApp message" IFTTT trigger and "Run a KumoApp" IFTTT action. In one example, you can install a KumoApp that turns on specific group of WeMo switches, and call it a certain name like "turn on all lights on second floor". Then use IFTTT action "Run a KumoApp" to run that app to achieve the effect IFTTT cannot achieve with a single recipe. In another example, you can write a KumoApp that logs a message using KumoApp.Log function when more than specified number of window or door is open. Then use IFTTT trigger "New KumoApp message" to trigger some IFTTT action. Supported triggers Many types of Internet based events. Motion, temperature too low/too high/change, humidity too low/too high/change, door/window open/close, PIR sensor detection/timeout, iOS device entering/exiting a location, water detection, and any trigger from IFTTT using the "Run a KumoApp" IFTTT action. Here is a simple example for the KumoApp "When any of the window or door is opened, turn off AC/heat." 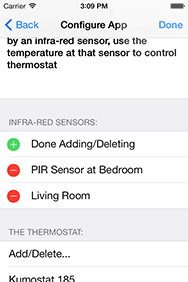 For example, if you write "<#Infra-red sensors__N#>" and "<#the thermostat__1#>" in your code, the configuration screen for iOS/web app would look like below, allowing user to pick one or more tags with accepted tag types. This is a the code for the KumoApp "Send push when no motion is detected for x minute". All global variables are saved and loaded automatically between each event call, and those starting with "$" will survive app re-starts. For example, below app will print 1, 2, 3, ... each time you stop it and then start it again. The global variable "$i" is automatically saved in database before the app is stopped and removed from memory. Only when you uninstall the app that all the saved global variables are erased. The automatic state-persistence is vital in order to allow any kind of feedback to regulate some sensor value. For example, to control dimmable LED such as WeMo, Hue or LIFX based on ambient light sensor reading, you must remember what dimming level you have set last time, so that you can adjust it higher or lower. Even if somebody adjusts the light to a dimming level different from $current_bri, the above KumoApp is essentially a feedback with 1st order integration, so it will allow the brightness to again settle to precisely the desired value quickly. This is not possible using a "stateless" systems like IFTTT. Because the automatic state-persistence, you can also implement learning/adaptive logic that spans over multiple events. Below is a KumoApp that notifies on your iOS/android devices whenever you set temperature on the specified Kumostat, estimated time to reach the set temperature based on historical statistics. The saved state / global variables is reset when the app is uninstalled. Use AppCoder see other examples and try out your idea today.